ORLANDO, Fla. – Let Paul be Paul. The phrase, common among staffers on Paul Ryan's campaign, is parlance for permitting the seven-term Wisconsin congressman to embrace his inner wonk, the side of his personality that led him to become the youngest House Budget Committee chairman in a decade as well as an intellectual force in his party. And in recent days, as the GOP vice presidential candidate has settled into his role on the Republican ticket, he has delved distinctly more often into policy details. This is from a politician who told Fox News' Brit Hume, "I don't want to get wonky on you," not long after his selection was announced. It came to a head on Saturday, when he stepped to the podium for a town hall at the University of Central Florida. 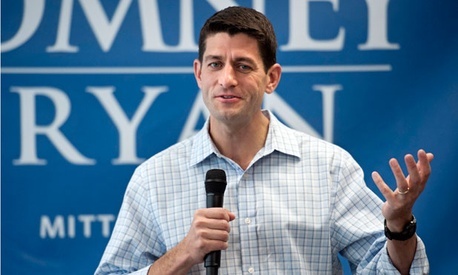 In addition to a debt clock -- now a must-have prop at Republican political rallies -- Ryan was flanked by two large screens that projected a favorite tool of academics and businessmen: a PowerPoint presentation. “I’m kind of a PowerPoint guy, so I hope you'll bear with me,” Ryan told the audience as he began clicking through four slides, which showed graphs depicting U.S. debt held by the public from 1940 to present, debt per person in the United States, percentage of debt held by foreign countries and a breakdown of federal spending. He then launched into a 10-minute monologue on the federal debt, throwing around terms such as “Congressional Budget Office” and “Treasury bills” to illustrate his point. "It's simply another tool to highlight President Obama's failed leadership,” said his spokesman, Michael Steel, of the new addition to Ryan’s stump speech. Talking more about the debt will almost certainly invite further criticism from Democrats, who often point out that Ryan helped vote for policies that exploded the debt during the last decade, including the Bush-era tax cuts and the war in Iraq. Dealing in harder facts and figures also may help Ryan rebut the charges of inaccuracy that have plagued some of his more vague rhetoric, such as his suggestion in his convention speech that Obama was responsible for the closure of a GM plant in Janesville that fact-checkers found was effectively shut down in December 2008 while George W. Bush was still president. There are other signs of Ryan’s penchant for policy discussion bubbling to the surface after his weeks on the campaign trail, where attack-dog rhetoric is perceived as packing more of a punch than a discussion of CBO baselines. After holding just one town hall during the first month of his time as a vice presidential candidate – a joint affair with Romney at St. Anselm College in New Hampshire – he has held three in the last two weeks. While these town halls are less intimate than they were when he conducted them as a congressman in his hometown of Janesville, Wis. (2,000 people packed a gymnasium at Central Florida University for the most recent one), they still allow Ryan to return to his format of choice. He’s also dedicating more time and energy in his stump speech to defending himself against Democratic attacks on his proposal to turn Medicare into a premium-support system while retaining the traditional option for seniors. His opponents have said the system will raise costs for seniors by thousands of dollars a year and end Medicare as Americans know it today. “That was rated the lie of the year last year,” Ryan said at the Orlando town hall, in reference to the line’s infamous status from the fact-checking website PolitiFact. In his speeches, Ryan has opted to attack Obama for cutting provider payments through Medicare and only outlines his plan in broad terms. The partisan attacks haven’t ceased – on Saturday, he accused the president of being “complicit with [Medicare] going bankrupt” – but beginning in a speech to the seniors lobbying group AARP on Friday, he began rebutting the term "voucher," a word that often surfaces in Vice President Joe Biden's speeches. “Let me explain: that’s a poll-tested word basically designed to scare today’s seniors," Ryan said. "Here’s what a voucher is: a voucher is you go to your mailbox and you get a check and you go buy something and you’re on your own. Nobody’s proposing that." “The reason I’m so familiar with this idea is that it works like the plan I have as a congressman, as a member of the federal employee workforce. You get a list of guaranteed coverage options. You can’t be denied. You pick your plan and Medicare subsidies your premiums based on who you are,” he continued. The PowerPoint slides weren’t necessarily a response to the criticism; an aide said they had been in the works for some time and Ryan’s defense of his Medicare plan at the AARP speech was not part of his prepared remarks but rather an off-the-cuff answer during the Q&A portion of the event. But if the Orlando audience was any indication, the discussion of debt as a percentage of gross domestic product was like red meat to the crowd.